Healthcare systems manage millions of patient encounters on a yearly basis. Today, valuable data points captured from these encounters can be harnessed to improve the health outcomes and reduce cost of care. This is where Quantiphi a category defining decision science and big-data analytics organization—comes in. Their population health analytics solution suite, Quantiphi Health creates a new path to business value creation through ‘impact ready’ analytics. Quantiphi Health aids clients in preventing high cost encounters, identifying prevalent chronic conditions in patient sub-groups and delivering efficient disease management programs. It helps healthcare systems attain data-driven answers with regards to decoding relevant data and providing actionable recommendations to better manage population health. “Quantiphi Health combines four fundamental building blocks—infrastructure, data engineering, machine learning, and intuitive decision support tools to enable clients to consume and analyze data better. The population health management solution of the Quantiphi Health suite empowers clients to achieve a bird’s eye view of the patient population and the relevant economics involved,” reveals Asif Hasan, Co- Founder, Quantiphi. The solution helps to reduce per member, per month cost of care and aids in understanding the drivers of clinical as well as business outcomes. 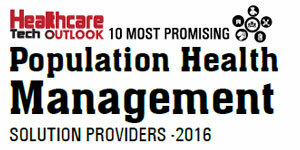 An integral component of population health management is incentive link reimbursement. Quantiphi Health identifies the measures that drive maximum impact to incentive-linked payments, allowing healthcare systems to run sophisticated sensitivity analysis and scenarios to determine achievable goals which maximize benefits within capacity and budgetary constraints. It aggregates publicly reported data on over 300 performance measures focused on factors from patient care, process of care, and health outcomes to cost for care and financial performance. “Our solution provides a flexible framework through which we can deliver highly customized and impactful data solutions,” says Hasan. Additionally, to manage clinical data, mostly unstructured, the company assembles and integrates data from disparate sources and gains actionable insights to increase business value. Highlighting an interesting case study, Quantiphi worked with a system of community hospitals that served sections comprising mainly of the underserved population strata, under the high-risk zone. The client is committed to delivering exceptional care regardless of ability to pay. From a business standpoint, they were running encounter analysis which was ad hoc in nature using excel files, for instance, without any real ability to measure risk. “Though the system gained insights from the data, it was failing to facilitate collaboration with the care-givers to deliver pro-active care management solutions across the continuum of care,” says the client. Utilizing Quantiphi Health, the client was able to leverage the combined data-set and aggregate the information at a level which ensured easy interpretation and action. Consequently, data management became simpler, resulting in better insights. Also, creating reports and dashboards became easier and the client was able to successfully host it in a collaborative website-based platform for easy sharing. “From the standpoint of our founding team, over the years, the ideas to harness the full potential of big-data analytics were simmering upto a point where they became absolutely compelling,” says Hasan. Quantiphi has initiated successful entries into newer verticals, while continuing to stay committed to healthcare solutions that improve outcomes while lowering costs. “Data-Science doesn’t demand an imperative geographical presence. We, as a company, aspire to leverage virtual technology and continue to successfully deliver solutions remotely—in the cloud, online or in applications,” he concludes.